Our movement had a modest beginning in 1971. 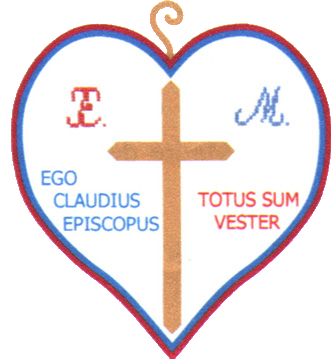 The initiators of the movement are the priest Claudio Gatti of the diocese of Rome and Miss Marisa Rossi of Rome. Don Claudio and Marisa started from different experiences and situations, but had in common the same ideals: to do something tangible for priests in difficulties and begin a more personal and incisive apostolate among the youth. Each of them gave up sure life perspectives (family, career...) to achieve that purpose and to answer the specific vocation they felt they had been called upon. We begun as a small group, but then, little by little, many more joined and this filled us with great joy because faith is an asset we deeply enjoy when it is lived in union with many brothers. Our first target was to focus on our work with the young people for they are far from sacraments and do not bring forward any religious education. We established some contacts in the place where they live and we tried to find the ones who were somehow interested in religious related problems. A year has passed and again I take up the meek and respectful conversation with all those brothers and sisters who want to give me their attention and show me their affection. Allow me to be sincere to the point of roughness and expound everything to you with frankness even to the extent of seeming intransigent. I have too much respect for the truth not to accept compromise and I love you all too much to exclude you from our life, even if it is a life that has known much suffering presented under various guises but ones which make one tremble: jealousy, envy, malice, defamation, calumny, dishonesty, presumption and pride. As you already know, the presumed apparitions were opened up to everyone on the 24th of October 1993, but prior to that the ecclesiastical authority had been informed. I think it is correct to say that this is the first time in the history of the Church that the ecclesiastical authority was informed openly at the start of public apparitions before anyone was admitted to them. In fact I myself, on the 24th of September 1993, spoke at length and in some detail about these presumed apparitions to the Auxiliary Bishop H. E. Mons. Cesare Nosiglia. 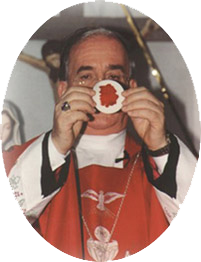 The year (1995) began with great suffering, when Cardinal Camillo Ruini, Vicar of His Holiness for the diocese of Rome, in a letter dated 6th December 1994, suspended the right to keep the Eucharist in our chapel and to celebrate Mass there. It ended in great joy in seeing the Eucharist miraculously appear on September 14th 1995 in the garden of our residence in Via delle Benedettine; this Eucharistic miracle, which has been repeated very often in the presence of thousands of people, continues to occur as we write. It can be affirmed that in this period of time the extraordinary has become normality and that these miraculous apparitions must above all be recorded, for the future, as Eucharistic apparitions. We who are members of the Movimento Impegno e Testimonianza have seen and we believe, together with many other people and we have the right to believe. Even during the year 1995-'96, we of the Movement "Impegno e Testimonianza" raise to the Lord our song of praise, alternating happy notes and sad notes. Around us, in fact, there is drawing close, as in a vice, a ferocious campaign of denigration, of malice, of slander and of defamation; priests, nuns and even several bishops continue to give in regard to us judgments which are contrary to the truth and not founded on charity; moreover they discourage lay persons in participating in our Biblical and prayer meetings and to attend the Marian and Eucharistic apparitions in Via delle Benedettine, 91, in Rome. We respect those who affirm not believing in the supernatural origin of the phenomena which many times we have witnessed, but we cannot permit anyone to put doubt on our honesty, good faith and mental equilibrium. Marisa, the young people, the grown-ups of the Movimento Impegno e Testimonianza "Madre dell’Eucaristia" announce that on 20th June 1999 Don Claudio Gatti has been ordained Bishop and has received all powers by Our Lord Jesus Christ, First, Supreme, Eternal Priest of the New Covenant, founder and head of the Church and of the ecclesiastical hierarchy. On the 11th of June 2000, feast of Pentecost, while I was celebrating the Holy Mass in the church "Mother of the Eucharist", a great Eucharistic miracle happened. As soon as I finished to say the wording of the consecration of the bread, blood began to come out from my host. Time stopped for me. I was bending over the host that I was holding tightly in my hands and I was gazing at the divine blood that was spreading on a great part of its surface. I haven't moved for a time that seemed endless to the present people, because they thought I was feeling sick, since on my face a shocking paleness and a strong blush alternated. Was integrally revealed the third secret of Fatima?